The ECE TA Training and Development Program is an initiative that reflects the longstanding tradition of strong peer mentoring in the department. The program is led by a select cohort of TATD Fellows who lead teaching workshops and serve as a mentoring resource for ECE Teaching Assistants. 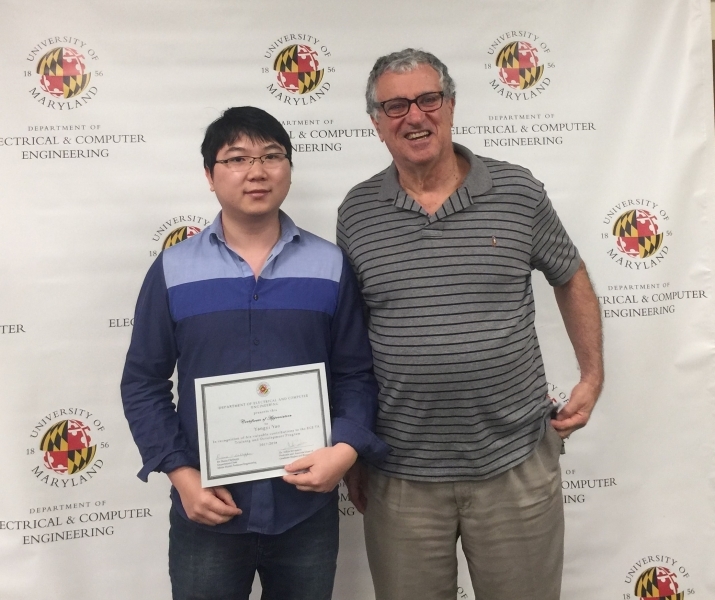 Yangyi Yao (2017-18 TATD Fellow) and Professor Dagenais. ECE TAs are encouraged to contact their TATD Fellow Mentor throughout the semester with any questions or TA concerns. New TAs are required to meet with mentors at a mid-semester check-in. TAs are required to attend two workshops per semester. April 17: "Being an Efficient First Time International TA: Know-How"
Being a first time TA is very daunting for international students who TA'd before in their home country. Imagine being a TA for the first time in your life. Intimidating, isn't it? In this session, a general overview would be given about what to expect as TAs in discussion/lab sessions and how to make your transition as smooth as possible. A fun-filled interactive session, with some of the senior TAs sharing their experiences and giving tips to enjoy the TAship can be expected. Returning/New TAs can discuss and learn new strategies and tools which can make their journey as a TA efficient. April 26: "Leveraging your TA Experience for your Career"
All TAs have to fill multiple roles as part of their graduate school life -- as a mentor, instructor, coordinator, collaborator. In this workshop, we will work together to identify some of the technical and interpersonal skills that come into play as a Teaching Assistant. We will then talk about the overlap of these skillset with different roles in the real world. Balancing among course work, TA work and research work can be a really challenging task. Time management skills are in great need especially when you have to handle all the three things aforementioned. In this workshop, I'd like to share with you my tips about how I survive and thrive a semester with three tasks together and some suggestions I learned from other successful people. March 29: "Managing Expectations: Professors, Students and Your Own"
The work of a TA involves preparing for the discussion/lab sessions, handling students in class, grading, preparing solutions for the exams, and above all, our own graduate work. Managing all these is a major challenge and I would like to provide some suggestions as to how to manage all these tasks. March 13: "Accommodating Students with Disabilities"
Students with disabilities are found eligible for classroom accommodations by meeting with a counselor to share their disability documentation and to discuss their specific classroom accommodation needs. As a TA, you will most likely implement the approved accommodations. This workshop will cover the student's rights and what you may and may not be required to implement. March 8: "Respect is the Foundation of Teaching"
One of the qualities of effective TAs is the development of a mutual respect with your students. In this workshop, we hope to show some simple ways to develop respect between you and your students, professor, and other TAs, to improve your success as a TA. For TAs who lead discussion sessions, holding students' attention throughout the session may become one of the toughest challenges. As an interesting comparison, television talk shows share some common features to TA discussions. A good host also intends to convey his or her ideas to the audience in an attractive form and the audience never feels bored or tired. Well, of course university lectures are much harder for the students to understand than entertainment news, but we could look into ways how talk shows make news alive and attract people. We could even come up with better ideas to improve the TA discussion sessions to include more interaction with students using our creativity during this workshop. February 14: "Keys to an Effective Discussion Session"
Discussion sessions constitute a major part of the ECE core courses, and usually the TA is responsible for holding it. The students usually have a great deal of expectations from the TA in these sessions. And hence, it is very important to deliver an effective discussion session. This workshop will try to cover the following topics: the expectations of the students in a discussion session, clarifying the concepts vs problem solving, keeping the students engaged, complementing the lecture by presenting suitable examples. December 3: "Do you Really Know How Your Students Learn?" As teaching assistants, we are used to standing on a higher level of understanding and trying to teach students the same way when we began to learn the course materials. What we sometimes neglect is the real learning process of different students. In a survey I did to some of my former students, it turned out their ways to accept new knowledge are actually very different than what I expected. It is due to the different education systems in my country and in the United States, which could be a common issue for most TAs. The replies from the survey drove me to hold this workshop to look from a US undergrad student perspective to understand their learning styles and expectations. Hopefully, it could help you know better of your students and conduct effective teaching in the future. November 14: "Grading: Friend or Foe?" Grading got you down? Tired of seeing stacks of papers pile up? Have we got the seminar for you! In this seminar, veteran TAs Drew & Mikey will lay out their best tips and practices for grading quickly and fairly. Topics will include: how to grade quickly; keeping your grading consistent; finding your best grading style; what happens when students cheat; grading strategies for working with your fellow TAs, and more! After this seminar, you might actually be excited about grading (or at least dread it a little less...). November 5: "Time Management Strategies for TAs"
Time management is one of the most critical skills to master for Graduate Students as we juggle teaching, research, studying, writing, and other priorities. This workshop takes a step back to look at the long-range goals that can guide you into choosing to day-to-day tasks and suggests practical strategies that you can employ to prioritize and manage the amount of time you allot for tasks. October 19: "Inspiring Critical Thinking: A Guide to Attacking Unknown Problems"
Most students want a straightforward solution to the presented problems. But that doesn't help in enhancing the problem solving aptitude. An effective TA must kindle the critical thinking among the students so that they learn how to solve unknown problems with the tools they already have in their repertoire. That involves seeking answers from the students and guide them in a step-by-step manner to the solution. The workshop will mention the ways and approaches a TA can use to encourage critical thinking and in turn enhance the students' problem solving capability. October 9: "Adapting Instruction Style for Students of Different Backgrounds"
Instructing a course as a TA requires more knowledge than just the subject matter; it also requires an understanding of the type of students one is instructing. In this workshop, attendees will learn how to adapt his or her instruction style to best fit the needs of the students taking the course. September 27: "Being a First-Time International TA: Tips and Tricks"
As international TAs, many of the problems are the same as those faced by local TAs, like time management, grading methods and leading a lab/discussion session. However, the international TA is new not only to UMD and to teaching, but also to this country. Two main concerns may affect you: language barriers and “culture shock”. To address the two issues, here are some tips. 1. Give your students a chance to get accustomed to your accented English 2.Make it clear to the class that they should let you know when they don’t understand what you say 3.Let students know that you care about them and their success in this course. 4.Not to be overly authoritarian 5.Keep in mind that you will make mistakes. September 21: "Preparing for an Effective and Smooth Discussion Session"
Having to prepare weekly for a 50-minute discussion session can be quite overwhelming at times, while doing your own courses and research work. Sometimes, you don't feel very confident however much you prepare, especially if you are not very comfortable with the material. In this workshop we will share our past experiences regarding the most efficient way to prepare for a discussion. We would like to focus on different aspects required to be considered, including trying to understand the students' perspective, fore-thinking about questions that can be brought up and in overall, seeing a Teaching Assistantship as a benefit than a burden. September 12: "Tips to Prepare for an Efficient Laboratory Session"
Conducting a laboratory session is rather different from giving a recitation. Lab sessions are generally predefined by lecture instructors, but it is TAs’ responsibility to ensure that students get the most out of the labs. In this workshop we will discuss how TAs can prepare for lab sessions, how to conduct the labs, and how to help students learn the most out of their time. We will also take a look at common issues we may run into during lab sessions, and come up with ways to tackle them. April 16: "Making Discussion Sessions Attractive and Innovative"
Discussion sessions are probably the most important time for students to reinforce their understanding of the course materials. Traditional ways of teaching are relatively good and widely expected by students, but the truth is some students will eventually be distracted and lose interest after several classes. The time has come for us TAs to think about how to add a "cherry on top" to our discussion sessions to decorate them to be attractive and grasp students' interest throughout the semester, without the loss of acedemic depth. In this TATD session, I will introduce ways based on my research and also my own experience to help make your discussion sessions more interesting, and hopefully help you become a more popular TA among the students. April 4: "Discussion Sections: Approaching with a Plan"
This TATD workshop will discuss structuring your 50 minute discussion section, and the importance of catering your discussion section delivery to the learning styles and needs of the students. We will talk about the topics that should be addressed during the discussion section, effective preparation, the importance of the opening, effectively delivering example problems, and how to communicate with your students to ensure that your teaching style is effective to their needs. March 29: "What Makes a Good Lecture?" A brainstorming workshop on what things make a lecture beneficial to students. Issues like how to best present different types of information, if additional materials should be supplied, the different aims of a lab lecture and discussion lecture, and class involvement will be discussed. March 12: "Labs: Saving Students from Stuffy Classrooms"
Labs are a chance for students to interact with engineering in a way not possible in the classroom. We will discuss how to make labs more interesting, how to take advantage of the atypical learning environment, and how to effectively engage students. Come prepared for hands-on education! March 7: "TAing a Course Without Sufficient Background"
There are instances when students are assigned as TAs for a course which they haven't studied formally before. Needless to say, this can turn nightmarish if not tackled properly. In this workshop, we explore tips from students who have been there, done that. With sufficient planning and effort, such courses can be brought to fruition. February 26: "How To Be a Productive TA"
As a Graduate Teaching Assistant, we play many roles -- student, teacher, researcher. When deadlines approach these demanding roles can make you feel overwhelmed. This workshop will cover some proven strategies that help you strike the right balance between your various responsibilites. We will learn how to properly Plan, Prioritize, and Execute to have a highly productive graduate career. February 13: "Different Student Types and How to Tackle Them"
From my TA experience, I have seen students of various kinds like ambitious - who would love to do anything different from the regular curriculum, enthusiastic - who want to learn and gain something from the course, question banks - who ask questions even if they are unnecessary, lazy - who would not want to do anything at all, few other students who would do anything for marks, and many more. I would provide some tackling strategies from my experiences to satisfy all the kinds of students. February 7: "Efficient and Effective Grading"
Fast and smart grading is paramount to student achievement and success; however, for TAs, it often consumes a great amount of time in order to be effective. While you grade, you may discover that your grading scheme is imperfect, often taking off too many points here, or being too lenient elsewhere. This workshop aims to provide veteran TAs a good opportunity to reflect on their own grading habits, and provide new TAs some real grading examples and tips to help harness their own grading skills. TAs attending have the option of bringing in assignments/quizzes that they have already graded, with student names excluded, for more interactive feedback. November 27: "Respect is the Foundation of Teaching"
I believe that the central reason why I am an effective TA is because I respect my students. In this workshop, I hope to show some simple ways to respect students and improve connections. November 14: "Some Tips About How to Prepare the Discussion"
I want to narrow down the discussion range mainly on how to prepare the discussion session. I will touch on the follow topics: 1. Try to be familiar with the syllabus of your course. Make sure to discuss with instructor about the logic or the flow of the course. And be sure to get familiar with everything before the first discussion session. 2. Multimedia instills more fun to the discussion. But try to explain well how the content you show is connected or interacted with the stuff in the course. 3. Evaluate the levels of your audience. Try to adaptive tuning the difficulties of your content. 4. Feedback matters. 5. What kind of materials can stimulate your audience to ask questions. 6. Show some of my work during my TA time. November 1: "How to Effectively Help the Students During a Lab Session"
Lab session usually requires the TA frequently interact with the students, and as the size of the labs differs, the workload differs. During the workshop, I'll share my experience of how to lead and guide the students effectively during the lab section considering the case of small group lab and big group lab, I will also provide some useful tips to the rookie TAs who will conduct a lab session as their first TA job. We will also discuss the issues that may happened during the labs, such as the malfunction of the apparatus, conflicts between students, and how to troubleshoot these potential problems in an effective way. October 26: "Being a Proactive Teaching Assistant/To Be or Not to Be (a TA)?" Friday, October 20: "Different Student Types and How to Tackle Them"
October 2: "Developing/Molding an Appropriate Teaching Style"
TAs may find their teaching styles to be effective in many circumstances; however, courses often fluctuate between professors, so being able to adapt is crucial to better aid students. In this workshop, a variety of tips and tricks will be presented to help TA's understand their own teaching styles, and how to form it into one that meets the current demand from students. A short discussion will then take place to address any questions/concerns. September 28: "Effective Interaction Between TAs and Different Student Personalities"
Discussion session is a precious time for students to review contents of the week and practice sample problems. It is very likely that students will mostly depend on their TA to clarify their doubts regarding the subject matters. At the same time, their expectations during the discussion sessions will vary from student to student. It is important to strike a balance while catering to their expectations so that a majority of the class will be benefited. Besides, by keeping a good interaction with students will let them release the pressure and get truly involved in learning. During the workshop, we will discuss different types of students and situations we might have to deal with as TAs. Furthermore, several good forms of interaction will also be discussed, not only in discussion sessions but also during offline periods, such as office hour, before or after discussions, emails, etc. September 22: "Maximizing the Limiting Resource in the Lab: You"
Often times, TAs are the most requested resource in the lab. You may be the only one, or one of a few people to assist students. Therefore, it’s important to maximize your ability to help as many students through their different problems. It is also important to make sure that your students get the most out of the lab, becoming self-sufficient in figuring out their own bugs. In this workshop, we will discuss ways to engage students in a way that helps lead them down the path of determining and resolving solutions to their own problems, with minimal direction on your part, and maximum learning on theirs. September 14: "Discussion Sections - Approaching with a Plan"
This TATD workshop will talk about structuring your 50 minute discussion section, and the importance of catering your discussion section delivery to the needs and learning styles of the students. I will talk about the topics that should be addressed during the discussion section, the importance of the opening, effectively delivering example problems, and how to communicate with your students to ensure that your teaching style is effective to their needs. Grading is an essential part of being a TA. We have a lot of things to grade: homework, quizzes, lab reports, exams, etc. In this workshop, we will discuss what is the best way to grade them, and how to grade effectively and efficiently—to encourage students to learn but not to cost ourselves too much time. May 3: "Community Event #2"
April 14: "TA Table Topics"
This workshop is focused around getting knowledge from your fellow TAs and having time to discuss different aspects of being a TA. There will be a set of predefined topics to generate discussion: such as difficult or inspiring students, things you felt you innovated. There will also be a call at the beginning of the workshop for the participants to write their own topic they're interested in. April 6: "Solution Manual: Working Effectively with Instructors of Different Styles"
Instructors have a variety of styles, even if they teach the same course. Each instructor has his/her own teaching style, requirements for recitations/labs, grading criterion, office hour specification, etc. In this workshop, I would like to provide a “solution manual” for TAs, for how to work effectively with instructors of different styles. I hope that current and future TAs could benefit from this presentation by getting familiar with and then getting prepared for possible instructor styles. March 14: "Community Event #1"
March 8 "Importance of Effective Communication in TA-ships"
One possible reservation TAs face is the possibility that the workload takes away from their time for research and coursework (dealt with in the last TATD workshop). I would like to address the role of communication - whether with professors, students or peers - in performing one's TA duties. I would also like to highlight how teaching might influence one's own perspective on research and career goals. I hope to leave the audience with some ideas on how to have the teaching experience be motivational and the role of effective communication that can leave the TA with a significantly positive experience. March 3: "Playing the Most Efficient Role: Holding the Discussion"
To achieve our objective of discussion session, we need to better tune our teaching system in a clever way. With the emphasis on teaching efficiency, I will talk about how to make the best of 50mins discussion to save the student’s time and effort learning the course from my personal experiences and invite you to share your experiences also. I hope more clever ideas and strategies will emerge with the lead of my discussion. February 22: "Utilizing Technology in the Lab and Lecture"
The teaching assistantship is an old and traditional position. The contents and responsibilities have changed very little over the years, and so have the techniques used to teach. However, these methods may not be sufficient for a newer generation of students. With the development of modern technology, can we adapt our current approaches and allow them to collide and sparkle with tradition? The answer is yes and the options are vast. The objective of this workshop is to provide participants valuable insights into the various ways of communication, teaching, grading, and use of simulation tools that adopt the merit of “cool” technology. We believe that these potential tricks will not only help students learn better but also let you, the TA, be more efficient. February 16: "How to Enjoy Being a TA"
Being a TA is an exciting experience. It is a great opportunity for us to communicate with students and be a bridge between them and the faculty. However, working as a TA sometimes is boring, especially when you teach the same course again and again. In this workshop, we will discuss how to enjoy being a TA while working as a TA. It will also be a good opportunity to share your stories and experiences to help improve our teaching skills and make us better TAs. February 7: "Effectively Conducting a Lab Session"
Serving as a lab teaching assistant, playing the role between the professor and students can be very challenging. How to effectively organize the 3-hour section, and hence have the class learn as much as possible during the time truly depends on the TA's input. In this workshop we will simulate common problems encountered in a lab, discuss best problem solving strategies, and simulate small lab scenarios. November 8: "Effective Time Management as a TA"
Being a teaching assistant is an exciting and fruitful experience for graduate students. However, giving discussions, grading homeworks, and attending lectures is without doubt a time consuming task. Effectively scheduling your TA duties can not only help you efficiently complete all the TA responsibilities, but also focus more on your research and course work. In this workshop, we will share strategies from our experiences about two aspects of time management: as a TA and as a graduate student. November 3: "Using Past Experiences to Their Fullest"
TAs come from many different backgrounds, including different countries, different academic environments, and industry. These backgrounds provide differing levels of knowledge in material taught, and teaching style. This workshop will examine the strengths and weaknesses of the different backgrounds, and explore ways the TA can efficiently and effectively fill gaps in their knowledge and help their students to learn. October 21: "How to Get Students to Talk in Class"
Getting students to talk during discussion/lab sessions is of great importance. It lets them express their concerns so that the TA would cover more points in his/her illustration. However, it is generally not easy to make students talk or speak up their minds during class (most will come with questions after class). In this workshop we discuss some ideas into how to alleviate this problem and encourage students to engage more actively in class. October 27: "Fine Tuning to Become a Better TA"
A TA plays an important role in aiding a student's understanding. Apart from being the first contact point to clarify doubts, a TA can be influential in motivating a student. It is essential to realize this responsibility and constantly try to be a better TA. Often, small details go a long way in improving your abilities. In the workshop, I'll discuss what I think are qualities that some of my great teachers and TAs had. October 6: "Independent and Cooperative Learning"
While working as a TA, questions like, "Should I make decisions without letting my professor know?" "Is it okay if I keep my own style of teaching?" and "Is my job just to make the professor and students happy?" will arise. I'll talk about such concerns from my personal experience addressing the topic 'independent or cooperative teaching. September 28 "Delivering an Effective Lecture"
Recitation plays an important role in the education process, specially for undergraduate courses. The goal of a recitation includes reviewing the lectures, solving problems and reviewing the material before exams. Different students have different expectations for the recitation session. Also, each student has his/her own speed/method of perceiving the presented material. As a result, delivering an effective one hour recitation can be quite challenging. In this workshop, we will discuss several approaches to deliver an effective recitation. September 22: "Community Event #1"
September 8: "Expect the Unexpected: Adjusting Myself as a First-Time TA"
Being a teaching assistant (TA) is very exciting and important for TAs, especially the first-time TAs. However, most of these new TAs don't have teaching experience. Many new TAs are new graduate students as well. They have to balance their coursework, teaching and research. This is even more challenging for foreign TAs, especially for whom English is not their mother tongue. In this workshop, we would like to give some suggestions to the new TAs helping them to adjust to this new environment, and be more comfortable as a TA. September 14: "Challenges in Lab / Effectively Managing a Lab Session"
In this workshop we will mainly focus on developing effective in-lab management skills. Is making a lecture in the lab helpful? How to present your idea to the students? Shall we spend the entire 3-hour session working with students? Through group discussions and ideas from the speakers, we will be challenged by real scenarios that are commonly seen in a lab session. Different ways to help with debugging will be reviewed. Inputs from the audience are welcomed.